An accumulator contains at least four teams. It can contain many more and can offer astronomical payouts, especially if a few heavy underdogs are involved. It is essentially an all or nothing proposition that can be very fun and rewarding if things break your way. An easy way to think of this bet is to imagine picking at least 4 teams, A, B, C, and D. This bet consists of a single selection, in which all teams must win. If only one, two, or three teams win, you will not receive a payout. However, if all four teams win, you are in luck. Your bet consists of four (or more) selections. These four teams are “linked” in that you either win all four, or collect a payout, or one loses and the bet is a loser. If team A wins, your original stake plus any profits are rolled over and automatically bet on team B. Then those profits are rolled over to an all-or-nothing bet on team C, and then again on team D.
Let’s start with an easy example, which involves a fourfold accumulator with all teams at even money. Team A wins. Your original bet is now added to your winnings to give you 2 units. These 2 units is now rolled over and bet again, on team B. They win as well. You now have a 4 unit bet on team C and they win. These 8 units is then wagered on team D and if they end up winning you are paid 16 units. However, most teams are not even money to win, there are usually underdogs and/or favorites involved in a fourfold accumulator. 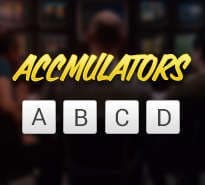 Let’s take a look at a more involved example, where you have an accumulator bet with team A at 2/1 3.00 +200 2.00 2.00 -0.50 , team B at 3/1 4.00 +300 3.00 3.00 -0.33 , team C at 2/1 3.00 +200 2.00 2.00 -0.50 , and team D at 5/1 6.00 +500 5.00 5.00 -0.20 . 1 unit is wagered on team A at the 2/1 3.00 +200 2.00 2.00 -0.50 odds and they win. Now you have 3 total units (your original 1 unit and the 2 units from the win). The 3 units are then wagered on team B, and if they win then you win a total of 12 units (3 units wagered at 3/1 4.00 +300 3.00 3.00 -0.33 odds, plus the original 3 units). Then the 12 units would be rolled over and bet on team C at 2/1 3.00 +200 2.00 2.00 -0.50 odds, netting a return of 36 total units (the original 12, plus 24 units for a 2/1 3.00 +200 2.00 2.00 -0.50 hit). Finally, the 36 units would be wagered on team D at 5/1 6.00 +500 5.00 5.00 -0.20 odds, which would result in a final payout of 216 units, which would be your original 36 units plus the profit of 180 units. Here is a step by step process detailing how to place an accumulator bet. The first step is to find your favorite sportsbook and get to their site. Now, log in to your account. Depending on the sports book, the bet will be listed under the main menu of bets or possibly a subsection. But once you find the section labeled “accumulator” you select that, and then choose how many teams you would like to include. Some sports books simply let you add teams to your bet until you’ve reached the maximum number of teams allowed on an accumulator. So you may just need to choose teams until you’re satisfied and then proceed as if you were placing any other bet. After you’ve picked the teams you will proceed on and you will get a “bet confirmation” notice before your bet actually is official. This lets you have one last look at your selections before putting your cash at risk. Once the bet is entered, it is official and cannot be altered, so be careful, and good luck! There are various calculators available online that can help you check your odds before placing your bet. These calculators can come in handy because as we saw above, the odds are not always even money ( 5/1 6.00 +500 5.00 5.00 -0.20 ). So if you have an accumulator with various favorites or underdogs involved, you will need to check the odds or figure them out on your own to check your possible payouts. Line shopping is important in this bet, as in any other. The higher the odds on each selection, the higher your accumulator will pay. Be sure to check around and find the best odds possible to increase your profits when you have a great hot streak and win your accumulator. There are various other accumulator style bets available at online bookmakers, for instance Yankee’s and Lucky 15’s.